Removing barriers to healtcare data exchange. Our Integration-as-a-Service solution is all about ensuring data sharing through simplified data interfacing. It enables you to exchange health data with a wide range of other healthcare providers. That means your patient demographic data, charge capture for billing, immunization records, lab orders/results, scheduling data, continuity of care, and other documents can be reliably transported from Point A to Points B, C, D, and E and back again. Our service also helps you stay on top of where a message is in the process, at any given time, through a graphical dashboard application. You can also feel confident in knowing that many leading lab companies, EMR systems, state registries, and clinical repositories throughout the country use our solutions. By using an “Integration-as-a-Service” delivery model, we have succeeded at facilitating real-time exchange of data at a highly affordable price point. Working with many of the leading reference labs throughout the country has allowed us to gain the knowledge necessary to build interfaces that effectively connect EMR systems with the lab order systems. Whether it’s a one-off integration or an embedded solution, we stand ready to work with an individual practice or reference lab to build a solution that works for everyone technically, logistically, financially. More and more imaging centers are recognizing the benefits of implementing orders and results interfaces with their referral partners. Having an interface for receiving orders makes the whole process much more efficient for the imaging center staff as well as for their patients. No more forgotten instructions or paperwork to cause a delay in providing critical imaging services. Referral providers are now, more frequently, looking to find partners that can provide the results electronically to their EMR so they can more easily document the patient record and be prepared for follow-up visits with their patients. 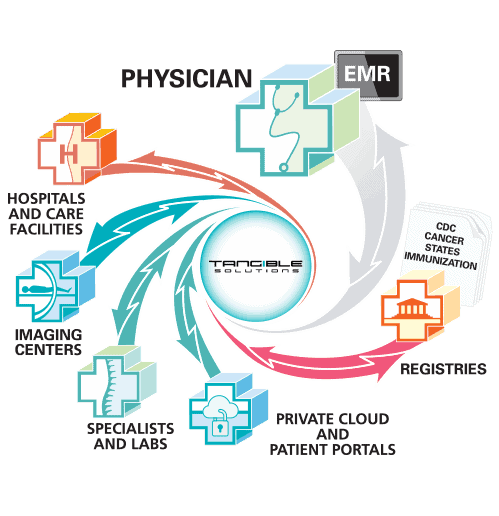 Integration-as-a-Service provides imaging centers many options for addressing EMR integration and other connectivity requirements. Regardless of whether you want to deliver results with the image, results as a PDF file to your referring physician’s desktop computer, or you want a bi-directional interface delivering both orders and results into their respective systems, Tangible Solutions is your integration partner. Being able to submit electronic data to state immunization registries is one of the requirements of Meaningful Use. It’s often largely up to you to determine how to do it correctly and in a timely fashion. Through our partnership with Xchange Technologies, Inc., Tangible Solutions offers you “set-it and forget-it” peace of mind. Our immunization submission solution processes the immunization records, generated by your EHR system, and transmits them via the specific protocol required by each specific registry. We have real-time, fully automated immunization submission capabilities with an ever-growing number of registries. You’ll also be glad to know that our service tracks the delivery of each submitted record to ensure that it was received by the intended recipient. Let us be your partner in success.